"The first permanent settlers [the Bee County area] sailed from Ireland in 1826. Women and children arrived in 1829 and helped to established the community of Corrigan, named for Ellen O'Tool Corrigan's husband. In 1828 William and Patrick Quinn settled in the Power and Hewetson colony at Papalote Creek, and in 1834 settlers from Tipperary, Ireland, landed at Copano Bay and went to the headwaters of the Aransas River (near the site of present Beeville), in the McMullen-McGloin colony. Other early residents included Martín De León, who established a ranch east of the Aransas in 1805, and the Castillo, Santos, and Moya families, who received Mexican land grants in the area in the early 1830s. 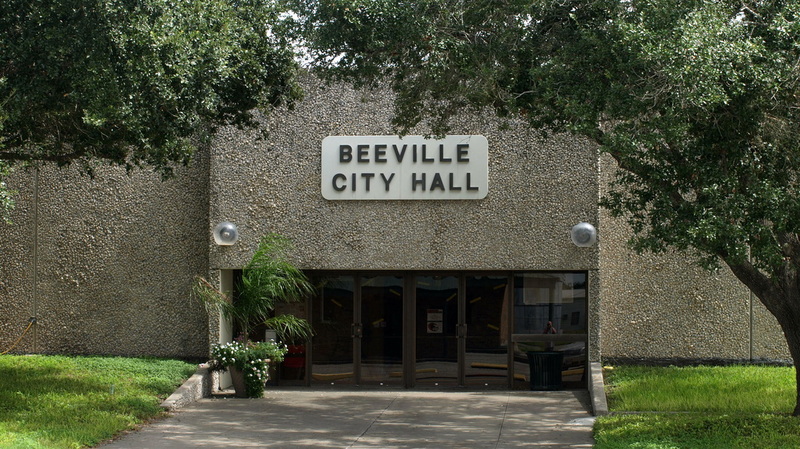 "Bee County was established shortly after the settlement of the Cart War, which originated ten miles east of the site of Beeville. 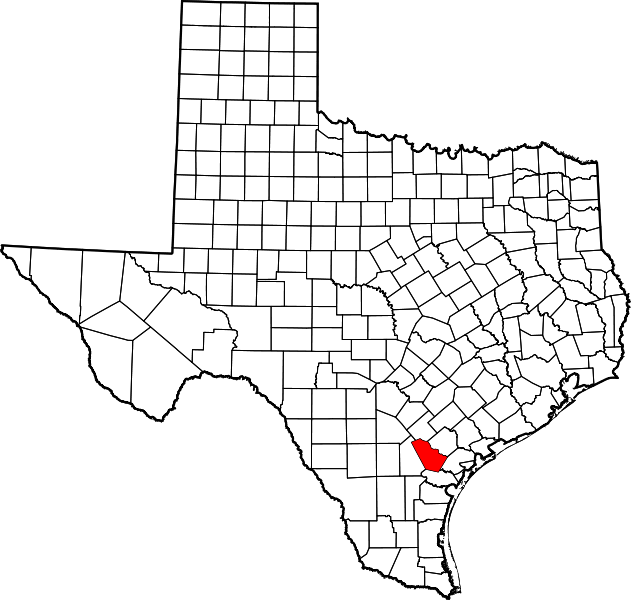 The county, named for Barnard E. Bee, Sr., was formed from San Patricio, Goliad, Refugio, Live Oak, and Karnes counties on December 8, 1857, and officially organized on January 25, 1858, when the first officers were elected. 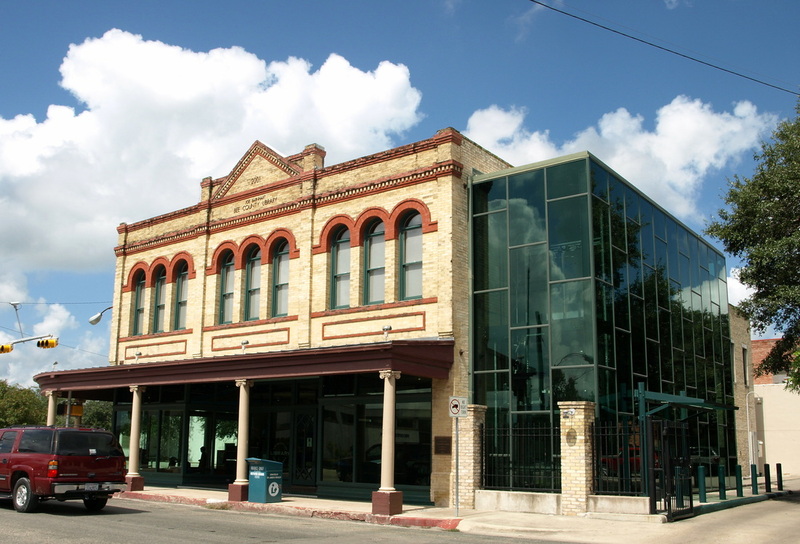 Beeville, the first county seat, was on Medio Creek, near Medio Hill, where the first post office had been established in 1857. 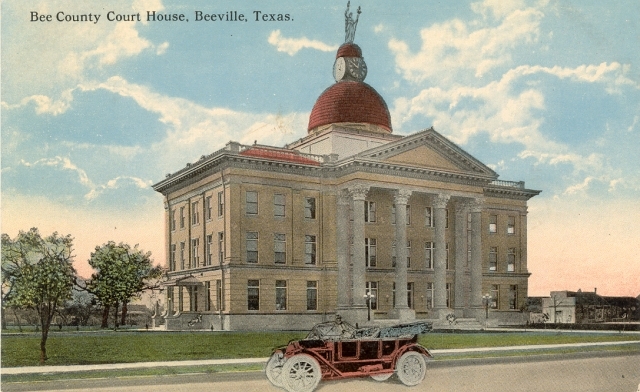 In 1860 Maryville became county seat; this community was later designated Beeville-on-the-Poesta to distinguish it from the former county seat." 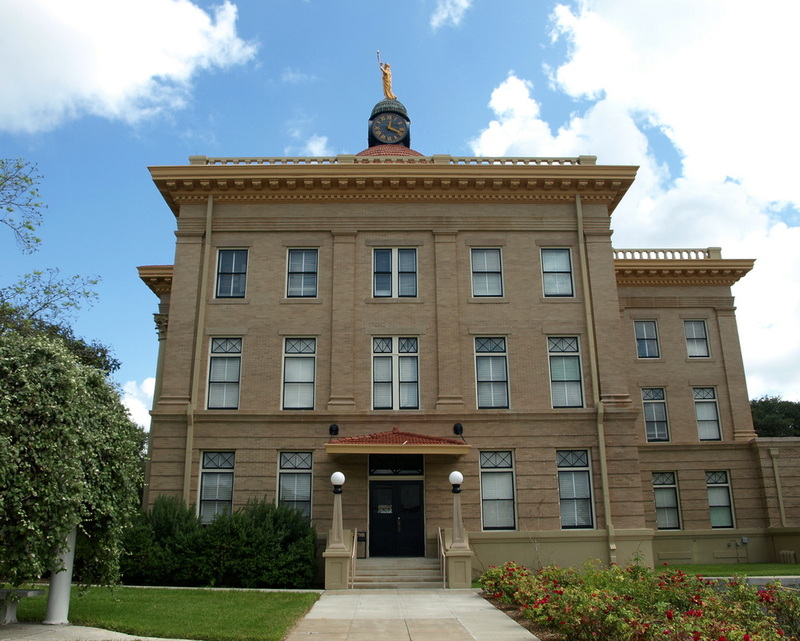 I visited Bee County and photographed the courthouse in Beeville on September 25, 2010 and October 27, 2011. 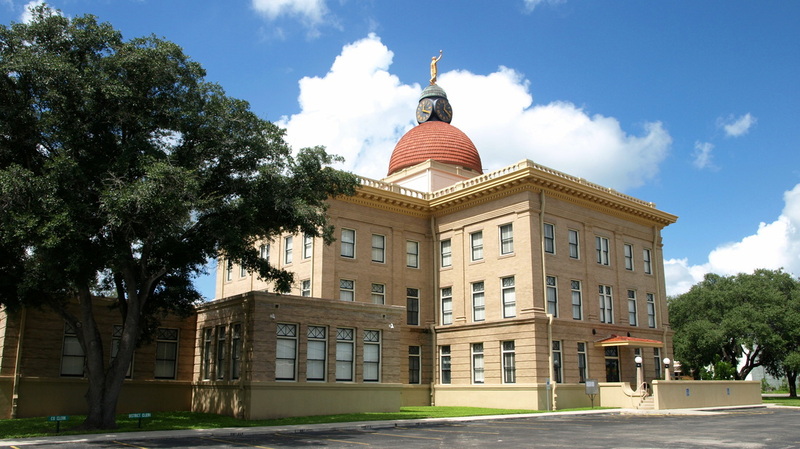 At sundown, approaching the Bee County courthouse from the west on US 59. 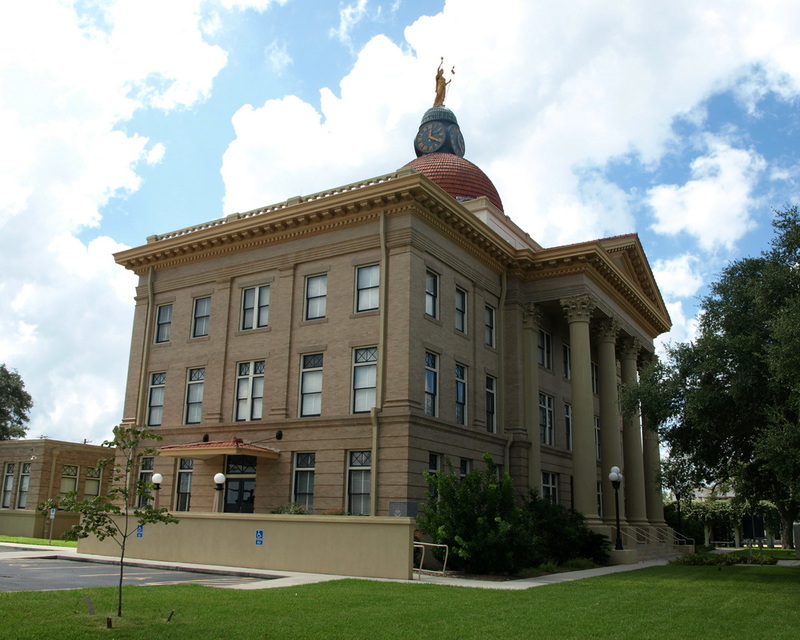 "The Beaux-Arts style 1912 Bee County Courthouse has taken on a fresh-but-historic appearance as a result of $3.8 million in state funding assistance. 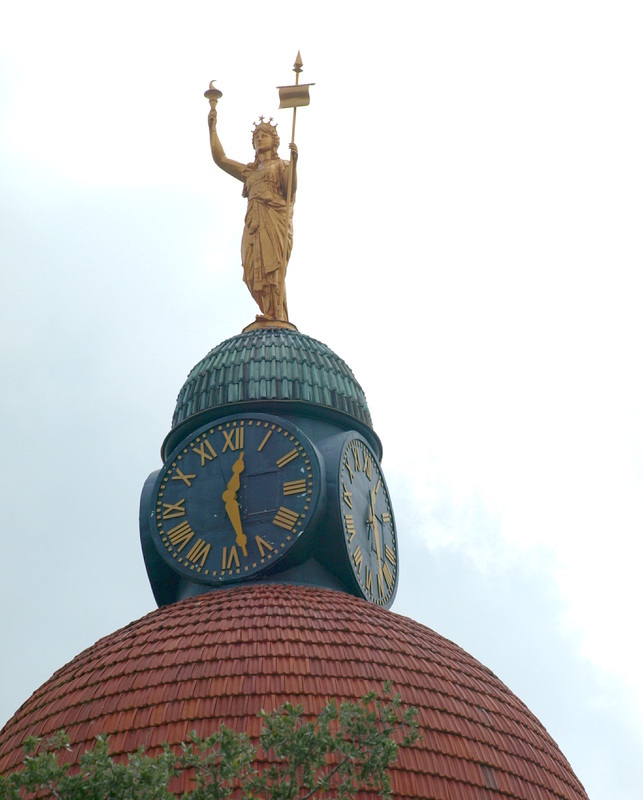 Work included rehabilitation of the historic wood windows, repairs to the tile-roofed dome and installation of a replica of the building's orginal decorative rooftop balustrade. On the exterior the new accessibility ramp was completed as was repairs to the building's brick and cast-stone masonry. To improve fire safety and accessibilitly, a new interior fire stair and a new elevator have been installed. Inside, the walls received paint in the building's historic scheme of rich gold, green, grey and black. In the grand district courtroom, a new pressed metal ceiling and balcony were installed, matching the original that was until recently only known in faded photos. 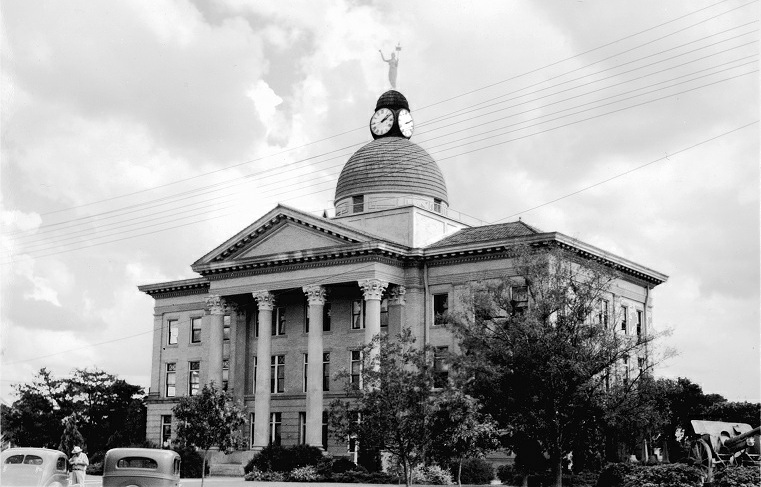 The courthouse was rededicated on May 11, 2006." 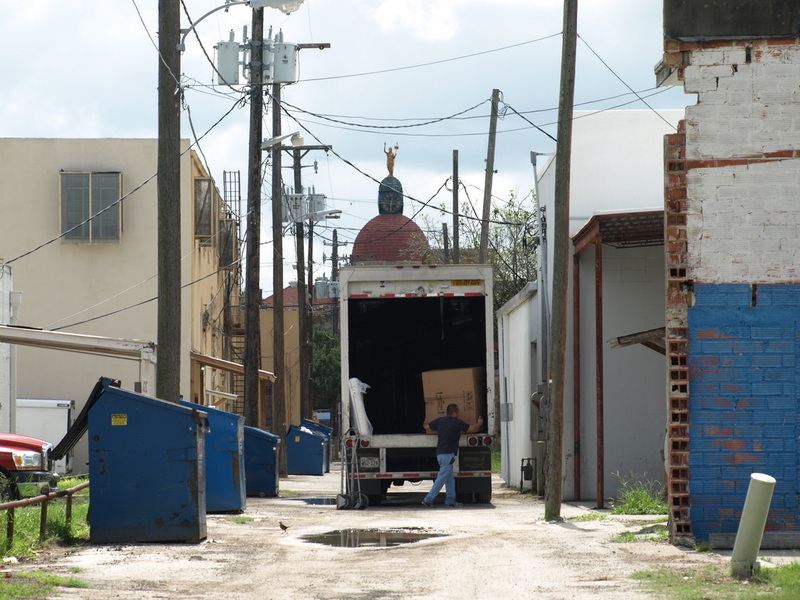 Lady Justice faces north/northwest towards Corpus Christi Street. 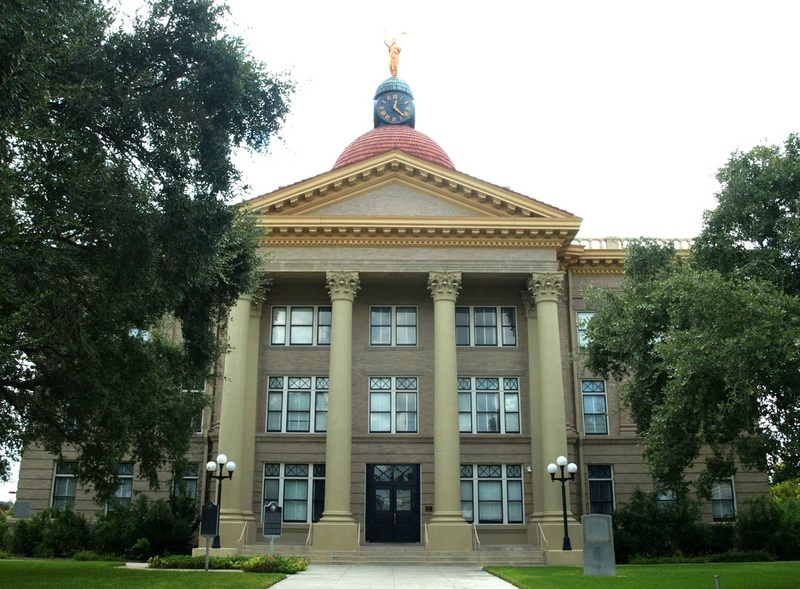 The front of the courthouse, on W. Corpus Christi Street, the north side of the square. The view from the front steps of the courthouse. Like so many squares, this one features an alley in the center of the block. 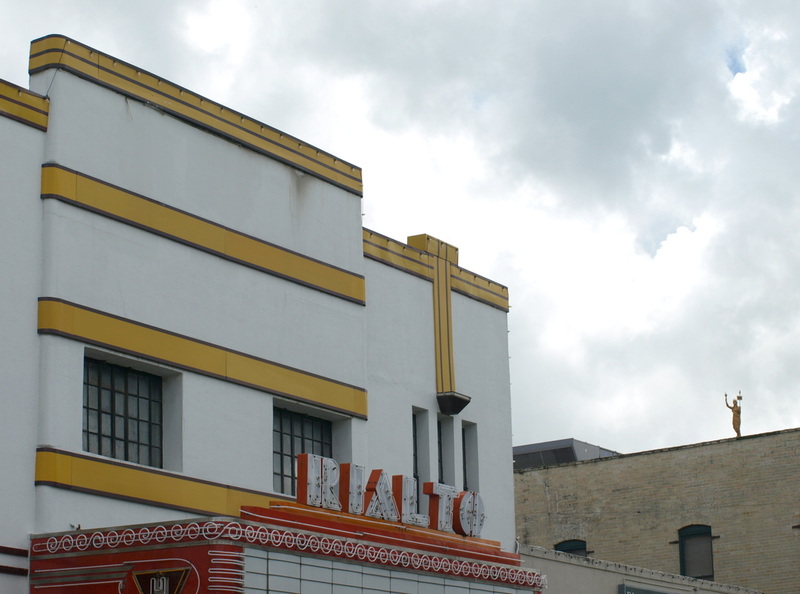 A view from the southeast, at the corner of Houston and St. Mary's Streets. 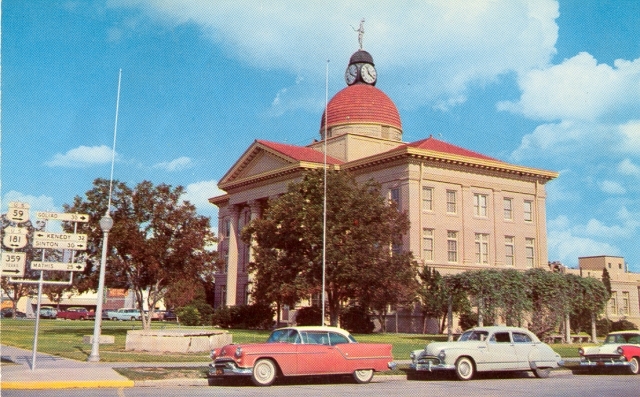 A 1943 addition to the courthouse is on the left. The west facade on Washington Street. 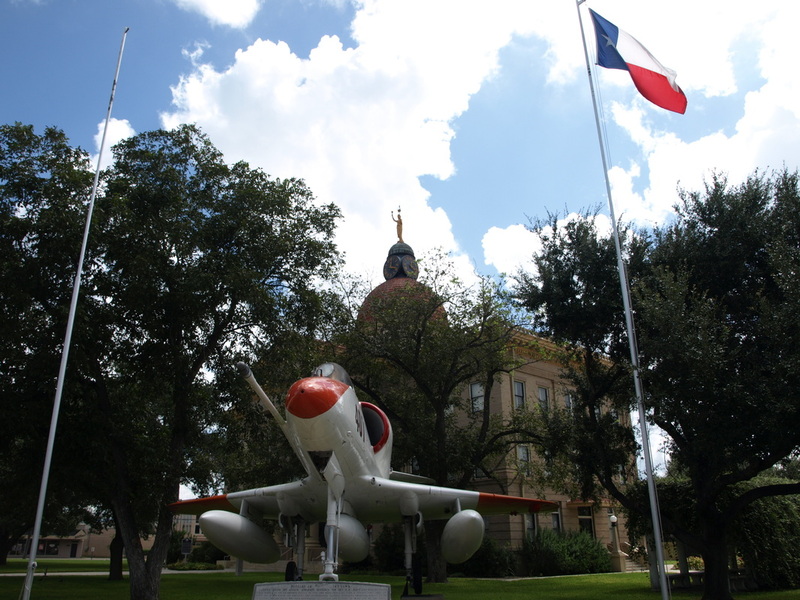 An aircraft on the courthouse square honors Chase Field at the Naval Air Station in Beeville. William Charles Stephenson, Jr., the architect of the courthouse also designed this theater. 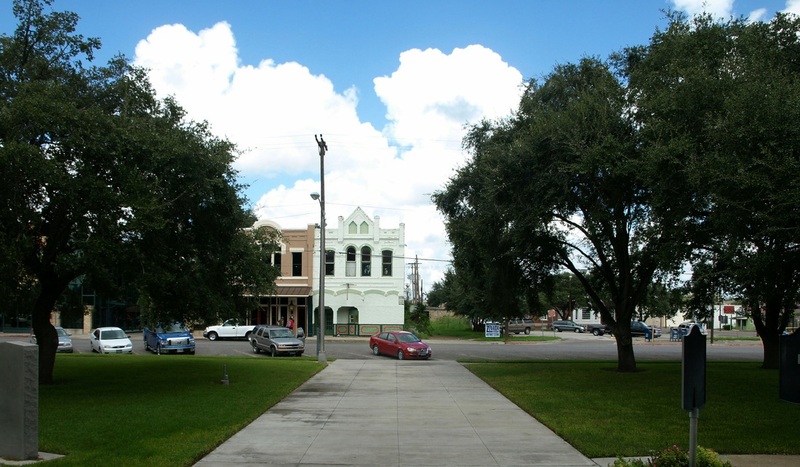 The Bee County Library on the courthouse square.